If you’re looking for great political satire, Ukraine might not be the first country that comes to mind. At the same time, with absurd amounts of corruption and political turmoil, the Eastern European nation provides ample fodder for mockery. As evidence, look no further than Servant of the People, a top-notch political comedy that’s now silently available on Netflix for global viewers. 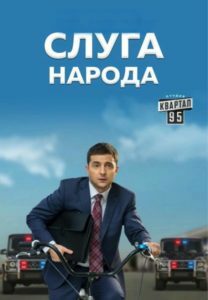 Servant of the People (Слуга народа in Russian, Слуга народу in Ukrainian) chronicles the (fictional) story of Vasily Petrovich Goloborodko, a high school history teacher who suddenly becomes President of Ukraine after a video of him ranting about corruption goes viral. A total political novice, Goloborodko recruits a motley group of friends as his ministers. Together, he and his merry band of reformers use amusingly creative methods to battle Ukraine’s entrenched corrupt interests, who respond with their own flavors of dark hilarity. 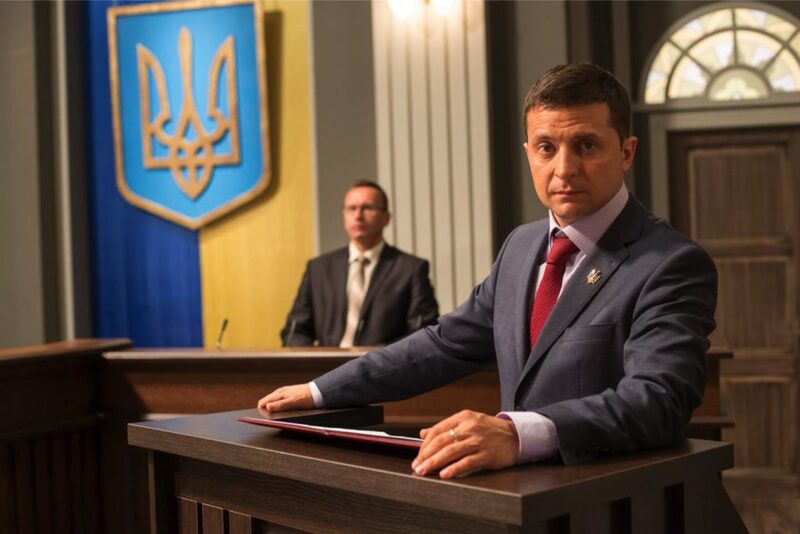 First released in 2015, Servant of the People quickly became one of Ukraine’s most popular shows of all time. One contributor to this popularity is the fact that all its episodes are freely available on YouTube (the pilot has 9+ million views) — albeit with English subtitles for only the first two of its 23 episodes. It was on YouTube (and thanks to this Foreign Policy article) that I first discovered the show while preparing for a vacation to Ukraine. After episode two, I was so hooked that I switched on YouTube’s automatic Russian to English subtitle translations so I could see more. To my surprise, the show was still pretty watchable. The fact that I could enjoy Servant of the People through the imperfections of machine translation is a testament to its accessibility. While the show was made primarily for Ukrainians, its humor remains quite universal. President Goloborodko is an approachable everyman, a fish out of water whose flopping on land translates well across cultures. He’s a President who still lives with his parents, who practices for speeches by stuffing nuts in his cheeks, who wakes up with a hangover after partying with an IMF representative. It’s not just Goloborodko though — his family and ministers are equally hilarious, whether his feisty sister or casanova Foreign Minister. As such, while prior knowledge about Ukrainian politics certainly makes the show more enjoyable, it’s not absolutely necessary. In fact, from a foreigner’s perspective, Servant of the People is a great way to learn more about the country. Corruption (at least in my opinion) happens to be one of the easiest dimensions through which you can learn about government. After all, greed is universal, and sometimes takes extremely hilarious forms. On this front, what makes Servant of the People far more powerful than any Western comedy is the extent to which its most laughable premises are based on reality. For example, Goloborodko prepares for his inauguration at an excessively opulent estate, complete with its own ostrich trainer. 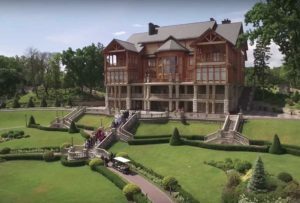 As it turns out, that scene was shot at the Mezhyhirya Residence, a 340 acre estate — which really has ostriches — built by former Ukrainian President Viktor Yanukovych using public funds. After watching scenes like these, you begin to better understand why Ukrainians overthrew Yanukovych in 2014 and wish that someone could reform their country in the way that Goloborodko is trying onscreen. Beyond high production quality and a solid story, maybe what makes Servant of the People so worth watching is how it embodies the hopes and fears of an entire nation. Three years after the Euromaidan Revolution, Ukrainians in the real world are still waiting for many of the changes they fought for. As they wait, Servant of the People helps them glimpse an alternate world, one that they can laugh and dream about. Now, we here in the rest of the world can share in their dream too. You can watch the full first season of Servant of the People on Netflix, or YouTube if you’re OK with machine translations. A feature film based on the show was released in December 2016, and a second season is currently under development. FOX has also bought US rights for a potential adaptation. In fact a full-length spin-off was released in Ukraine on December 24, 2016. Gross box-office totaled about 877,000 USD with total admissions about 340,000. Hi Alex, thanks for the information about Servant of the People 2’s release! We’ve updated the end note of our article accordingly.